Throughout Church history there have been times of peace. The early apostolic church suffered from very heavy persecutions under Nero, who was trying to wipe out the church and killed many, but instead of wiping out the church, the church grew. The early church continued suffering persecution until Constantine embraced Christianity. Unfortunately Constantine compromised with the world and kept many of the pagan symbols and customs of various religions in order to unite all people under the banner of Christianity. At that time there was relative peace in the Empire and the known world. When the Roman Catholic church came into existence in the 4th century, there was relative peace, but they also lorded over the people and kept them in darkness. People didn’t have Bibles on their own to read and they followed whatever the Pope and the Priest would tell them, many things that had and have no biblical grounds and it was taught in Latin. In the pre- reformation period, the Roman Catholic Church persecuted and killed those who translated the Bible into English. Later with the reformation at the time of Luther, many suffered persecution and death. The reformation gave the word of God back to the people into their own hands. People were finally able to read the Bible in their own language and they learned from it that salvation is by God’s mercy and Grace. Luther re-introduced the biblical teaching that was lost, that “the just shall live by faith.” Something that the Roman Catholic Church did not teach then and even until today. They still teach that salvation is based on works, good behavior and continues membership in the Roman Catholic Church. There always have been some kind of persecutions throughout the history of the church. In the 20th century alone, more Christians have been persecuted and killed worldwide then in the 19 previous centuries. Christian are persecuted in the Middle East, Africa, China and many other places. In the US for example there is relative peace to worship and live as a Christian at this time, which may change in the future. The problem with “peaceful Christianity” is that it can lead some Christian’s to become complacent and comfortable. The believers that are persecuted worldwide, live out their faith, even unto death. The church has always grown under persecution. For example here in the US we have Bibles, we have technology to reach the world, but for whatever reason, there are still many unreached people. Why is that? Have we become comfortable and complacent? Unless someone goes into those unreached areas and preaches the gospel, how will they know about Jesus and the free gift of salvation? Many sit in the pews on Sunday’s and think, well, that was my service for the Lord and they go on with their busy lives during the week. That maybe peaceful but at the same time very comfortable and complacent. Jesus Himself said this: “These things I have spoken to you, that in Me you may have peace. In the world you will have tribulation; but be of good cheer, I have overcome the world.” John 16:33. There can be peace for a Christian, but that also means that they may have compromised with the world. If anyone anywhere in the world lives and proclaims the name of Jesus and teaches biblical principles, he or she will face some kind of persecution on way or another, either from the government, religious leader and people in general. “Yes, and all who desire to live godly in Christ Jesus will suffer persecution.” 2Timothy 3:12. Here is a so-called Christian (I chose him just as an example) that has compromised the Gospel and compromised with the world: The Archbishop of Canterbury. “Dr Rowan Williams also criticized Christianity’s history for its violence, its use of harsh punishments and its betrayal of its peaceful principles.” That in part is true, I can not make any excuse for the history of the Church, some terrible things were done in the name of the Lord. But were those crusaders real biblical Christians? Or the inquisitions led by the Roman Catholic church, real biblical Christianity? I think not. Many horrible things have been done throughout the history by the organized church. Just because someone or a denomination calls themselves Christian, does not necessary make it so. Jesus never told His followers to kill and overthrow governments or persecute those who do not agree with certain dogmas. He said: “love your enemy, do good to those who hate you”. 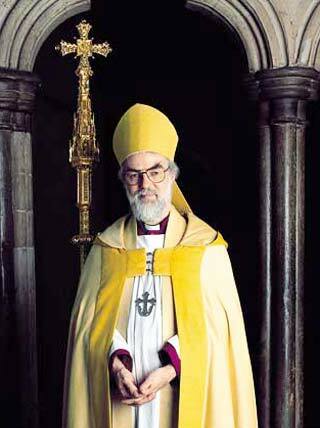 Dr Rowan Williams also said the Christian belief in the Trinity; “that God is Father, Son and Holy Ghost at the same time – “is difficult, sometimes offensive, to Muslims”. Considering his influence as a church leader, maybe he could reach out to the Muslim leadership and community and explain why Christians believe in a triune Godhead i.e. the Trinity. The concept of the triune nature of God is found in the very first page of the Bible in the book of Genesis. We as Christians believe in One God, we are monotheist. The Gospel of Jesus Christ and salvation through Him alone is offensive to many, including Islam, Atheist who really are Anti-theist and many that do not want to believe or are blinded by the god of this age. “For the message of the cross is foolishness to those who are perishing, but to us who are being saved it is the power of God.” 1Cr 1:18. We can either compromise with the world, being quiet trying not to offend anyone, or we can speak the truth in love to those who will perish without the Son. Let us pray that many around the world would have their eyes opened through the love of Christ. It is all about Jesus, not a church or denomination, we follow Jesus, not the teachings and opinions of man. Thanks Noel, I was thinking about that, but I didn’t wanted to turn the whole article into a Roman Catholic bashing. I touched on it very briefly, I may reconsider and update a few things. Thanks for your feedback. Be blessed, Freddy. I like your post Freddy, but I wish you had delved a little deeper in the inquisition which was carried out by the Roman Catholic. Most people do not realize that until the late 18 Th to early 19 Th century the Catholic Church had been an antagonist. One of there very own, Martin Luther had to live in exile until he died because of his interpretation of Justification. Thanks a lot for sharing. God bless. Reblogged this on Media 4 Life Ministries. Thank you, same here. I’m kinda new to WordPress, thanks for the follow and kind words. It’s a pleasure meeting you. Be blessed, keep up the good fight, run the race, Freddy.